The N.C. Chronicles. : Ever wonder where 'This Is What A Feminist Looks Like' T-shirts are made? Ever wonder where 'This Is What A Feminist Looks Like' T-shirts are made? 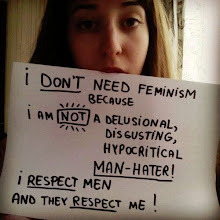 Feminists do "not" represent women, they represent themselves and their twisted agenda, usually of hatred and an inferiority complex. They will use any man, kids and now even women to achieve or push their idiotic ideas. That is the extent of their argument. "THAT IS WHAT A FEMINIST REALLY LOOKS LIKE"